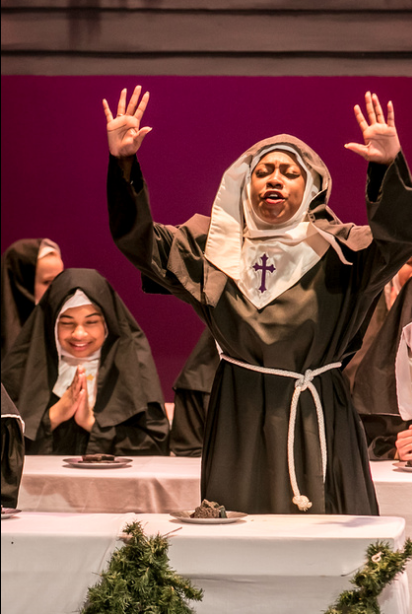 GREENSBORO — There was a universal question on the minds of fans as they left each of the seven performances of Sister Act inside the Weaver Academy auditorium: How on earth are they ever gonna top this? The cast and crew of “Sister Act” played to a series of packed, engaged crowds and were asked to do one thing: Deliver the story of a girl from the wrong side of a tracks who witnesses a murder and hides in a convent, ultimately becoming a voice of reason and courage – do all that, in comedy form, and, oh yeah, do it better than 1992 Hollywood film starring Whoopi Goldberg. 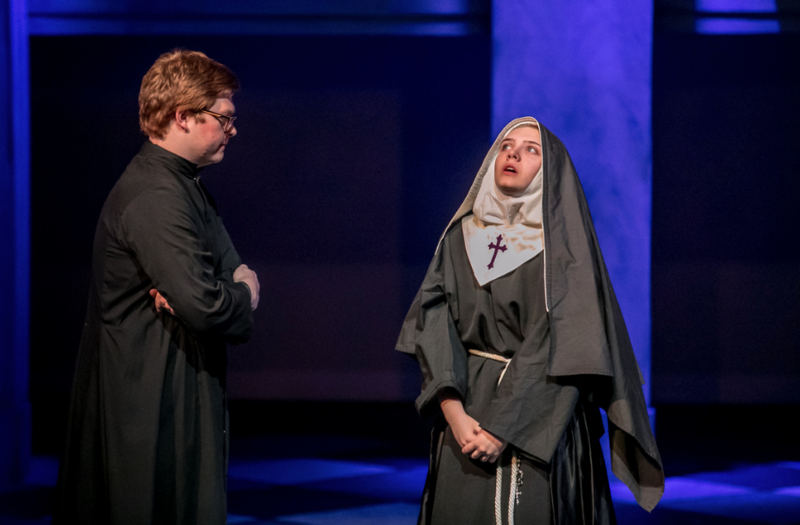 Bronwen Bradshaw’s portrayal of Mother Superior was spot on – in humor, in seriousness and in song. Zechariah Luck, was Monsignor O’Hara, was a near-perfect counter to the range of emotions Bradshaw offered the audience. Check. Check. Check. Check. Check and check. The cast, led by Tenayjah Hawkins’ portrayal of aspiring lounge singer Deloris Van Cartier, and Bronwen Bradshaw as Mother Superior, was simply superb. From the stage manager to lights and sound, from the orchestra underneath the stage to the ushers, each visit offered a performance to remember. Hawkins, in perhaps the most difficult role in the play, was unflappable. She easily — and convincingly — transitioned from drama to comedy and back to drama as her character evolved from a person in the wrong place at the wrong time to one garnering the respect of the highest (Catholic) order. Bradshaw offered a Kate McKinnon-like performance. She hit every punchline like a professional boxer, her facial expressions were picture-perfect — and, boy oh boy, what a set of pipes! Halee Myers was unbelievably believable as Sister Mary Patrick, whose air of innocence is complemented by a genuine belief in the goodness of everyone. She was reminiscent of another crowd-pleasing character from Disney’s “Frozen.” In fact, Myers could easily be considered the best possible female version of Olaf in regards to mannerisms and a happy-go-lucky approach to life. Tenayjah Hawkins not only stole the script from Whoopi Goldberg, she made it better. And Jack Greenberg’s role as Eddie “Sweaty Eddie” Souther, an aspiring detective whose never quite as good as he aspires to be but never as bad as he thinks, beckoned older fans back to a young Tom Hanks, back to a time when comedy was clean for just about everyone – but still hilarious. This is by no means an all-inclusive list of favorites – merely the highlights of a middle-age theater fan. Writing this nearly a week after the third-to-last performance, it’s difficult to recall each performer. It was easily one of the best high school performances this writer has ever seen as a community journalist over the past two decades. I can’t wait to see what the students try to conquer next — but whatever show it is, you can be sure I’ll have a seat. Did you miss it? You’re worse off if you did, and you don’t even know it. I hope you don’t let the next one pass you by. And if you’re really interested, a video of the performance can be checked out from the Weaver Academy library. Nuns – Seania Burnett, Lucy Hampel, Frances Porter, Abby Burris, Chandler Harris, Sarah Ramsey, Samantha Cobbell, Anna Korotitsch, Livi Southard, Maggie Coscia, Ally McLean, Sophie Stewart, Livia Donato, Maleah McPherson, Kennedy Talton, Camille Everett, Rachel Montgomery, Jordan Taylor and Ashley Pennington. Ensemble – MJ Dorsey, Calley Hull, Matthew Little, Lawrence Geller, Rahim Khaliq, Sophia McKinney, Graham Holder and Rachel Wall. Featured dancers – Victoria Butler, Sanai Johnson, Brianna Roberts, Peyton Gray, Matthew Middlebrook, Khi’ Shawn Robinson, Trinity Evans, Petko Novosad, Aisha Sougou, Macie Jenson, Jackson Perry and Alana Walker. Sound – Catie Alewine and Danielle Aikens. Spotlights – Skylar Hatch and Emily Moxon. Make-up crew – Bronwen Bradshaw, Abby Burris, Alex Contianos, Brianna Roberts and Courtnee Rouse. Additional choreography by – Khi’ Shawn Robinson and Alana Walker. Publicity crew – Isabel Egbert, Calley Hull, Lily McGlothlin, Sanai Johnson and Samya Warren. Props crew – Chakra Cook, Izzy Dumond, Magnolia Ramsey and Jessie Washington. Costume crew – Annie Conrad, Trinity Evans, Tashiana Potts and Emma Swofford. Featured backstage crew – Connor Fogleman, Raheem Khaliq, Sophie McKinney, Macie Jensen and Sania Johnson. Front of the house – Isabel Rhoten.